The design turns the classic industrial lampshade into a playful, dynamic lighting feature – encasing it in a geometric timber frame. 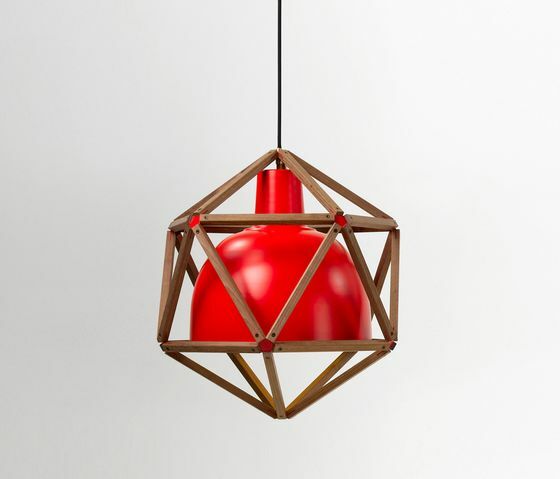 The unique icosahedron frame allows the light to be positioned on one of 20 bases, providing versatile light play in any room. The product’s name rises from the warehouse in which the original shade was found – Block 2. Neither a pendant, nor conventional floor lamp, Block 2 can be stacked or arranged in countless ways to suit any space. The frame is a combination of steamed acacia struts, held together with colour-matched custom aluminium brackets and blackened Tolix screws. The shades are spun in aluminium to replicate the found original and are available in 4 base variations: black, white, red, anodised aluminium. Custom colours are available on request. The frame is a combination of steamed acacia struts, held together with colour-matched custom aluminium brackets and blackened Tolix screws. The shades are spun in aluminium to replicate the found original and are available in 4 base variations: black, white, red, and anodised aluminium. Custom colours are available on request. Block 2 makes use of an E27 socket. This allows easy replacement of the lighting source with commercially available light bulbs. Röthlisberger Kollektion recommends the use of LED lights which can be included on delivery. However, there is nothing standing in the way of making use of smart bulbs. Design 2009.